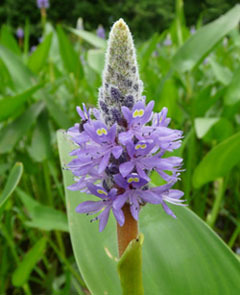 Pickerelweed is a valuable food source for large variety of aquatic and terrestrial animals. The large leaves and clusters of stems provide an excellent sanctuary for fish, birds, swimming mammals, amphibians and reptiles. Pickerelweed has a dense root system and stems which provide a wave barrier for protecting shoreline sediment from erosion. 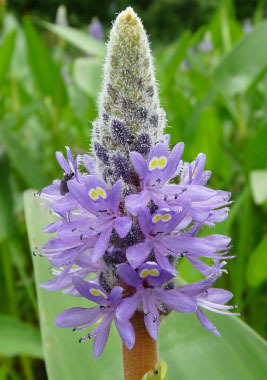 Pickerelweed received its name from the pickerel fish, with which this plant is thought to coexist. Flowers: Pickerelweed flowers have large spikes with clusters of small violet-blue flowers. Each flower is small, less than two centimetres wide and has fine hairs. It also has two small yellow spots on one petal. Pickerel will flower from June through late fall starting at the bottom of the spike moving upward over time. 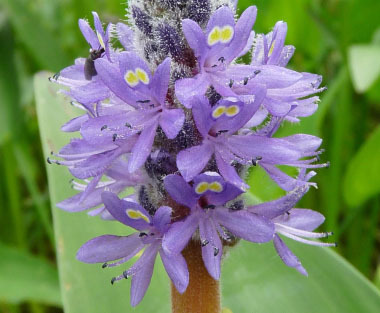 Fields of Nutrition has medicinal benefits and vitamin/mineral content of Pickerelweed. Leaves: The leaves are glossy green, and somewhat heart-shaped with long, air-filled stocks and firm blades with an indented base.. The leaf-blades have fine parallel veins. The leaves measure 10-25 cm. in length, and have long petioles that extend from the submerged base above the water level. 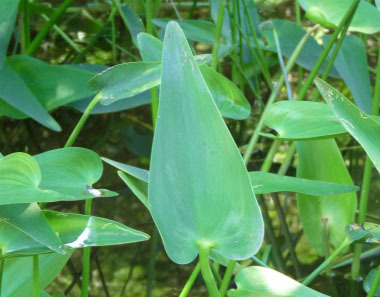 Height: This aquatic plant is technically quite tall as it can reach heights up to two metres however much of that can be below water level. The above water height is approximately 30-60 centimetres. 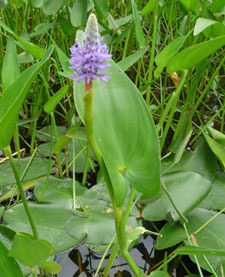 Habitat: Pickerelweed grows in shallow freshwater that includes lakes, streams and in wetlands. 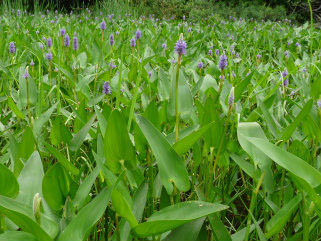 Pickerelweed tolerates water levels from ankle-deep to almost two metres (six feet) deep. It can grow in a variety of sediments and will form spreading colonies in protected areas. This "water weed" is found primarily in eastern Canada and the U.S., Europe, Central and South America, several countries in Africa, and in Australia. Its origins are in the Americas. Edible parts: Pickerel seeds are tasty when roasted but they can be eaten raw or cooked. They are best collected when they fall into your hand right off the plant. They can be ground and made into flour or toss some seeds into your bread recipe. The young leaves can be eaten as greens; boil older leaves before ingesting. Young stalks are also edible. Caution: Be sure that the water source you harvest pickerel from is not polluted.